A multiple lime series design” as used to examine the buildup effect of increased advertising. The data were obtained from the Niclxen BASES split-cableTV advertising field experiment ln the split-cable system. one group of households was assigned to the experimental panel and an equivalent group to the control panel. 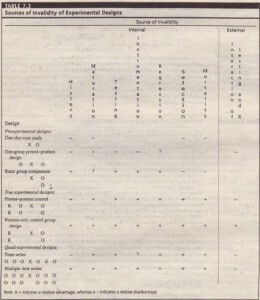 The two groups were matched on demographic variables. Data were collected for 76 weeks. Both panels received the same level of advertising for the first 52 weeks for the brand in question. For the next:24 weeks, the experimental panel was exposed to twice as much advertising as the control panel. The results indicated that the buildup effect of advertising was immediate with a duration of the order of the purchase cycle. Information of this type can be useful in selecting advertising timing patterns (allocating a set of advertising exposures over a specified period to obtain maximum impact). 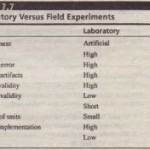 In concluding our discussion of experimental, true experimental, and quasi-experimental designs. 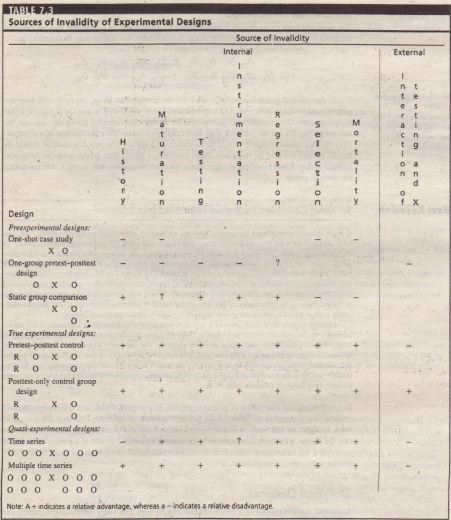 we summarize in Table 7.3 the potential sources of invalidity that may affect each of these designs. In this table, a minus sign indicates a definite weakness, a plus sign indicates that the factor is controlled, a question mark denotes a possible source of concern, and a blank means that the factor is not relevant. It should be remembered that potential sources of invalidity are not the same as actual errors. 1. The effects of more than one independent variable can be measured. 2. Specific extraneous variables can be statistically controlled. 3. Economical designs can be formulated when each test unit is measured more than once. A randomized block design is useful when there is only one major external variable. such as sales. store size. or income of the respondent. that might influence t~ dependent variable. The test units are blocked. or grouped. on the basis of the external variable. The researcher must be able to identify and measure the blocking variable. By blocking. the researcher ensures that the various experimental and control groups are matched closely on the external variable. A factorial design is used to measure the effects of two or more independent variables at various levels. Unlike the randomized block design and the Latin square, factorial designs allow for interactions between variables.” An interaction is said to take place when the simultaneous effect of two or more variables is different from the sum of their separate effects. For example, – an individual’s favorite drink might be coffee and favorite temperature level might be cold, but this individual might not prefer cold coffee, leading to an interaction.